Straw generally refers to the stem, leaves and fringe of mature crop, including wheat straw, rice straw, maize straw, cotton straw, etc. They are abundant in harvest seasons, making up about half the yield of crops. Straw contains nitrogen, phosphorus, potassium, calcium and other organic substance. The crude fibers take up 30%-40%. It is an important raw materials for making paper, biofuel, animal fodder and horse bedding. Leaving straw on fields can cause the emission of green house gas like methane. Burning them directly to generate heat is a waste of resources and harmful to environment. Nowadays, with the increasing cost of fossil fuel and the maturity of biomass application, more and more people choose to make straw pellets to improve added value. The main composition of straw are cellulose, hemicellulose and lignin, which contains a large quantity of biomass energy. The following chart shows the properties of 3 major crop straws. Straw features high calorific value and low moisture content, so it has always been used as fuel. When we make it into pellets, the calorific value go up to 18-19 MJ/kg, the ash content is under 3%, the moisture content under 10%. The ash from straw pellets combustion can facilitate plant growth as mineral fertilizer. Burning biomass pellets means giving back the carbon that plant absorbed during growth, so there is no additional carbon to the natural world. Namely, the net influence it exerts on natural carbon recycle is 0. Making straw pellets can increase their density so that they are easy to store and transport. They are burned in biomass boiler as an excellent substitute for fossil fuel. Besides, it has wider applications like horse bedding, pet bedding and animal feed. 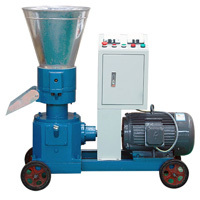 Straw pellet making machine is used to process bulky rice straw into biomass pellets. TICO developed a series of pellet machine according to the characteristics of crop straw. It is small and portable with high efficiency and affordable cost, suitable for farmers who intend to make profit from agriculture waste. We provide straw pellet making machine driven by electricity, diesel, gasoline, and PTO. Diesel engine type is more suitable for outdoor work where you have no access to power supply. PTO type works by connected with a tractor, so it is more cost-efficient for users who already have such machinery. Crop straws need pretreating before making pellets. The moisture content should be around 15%, or it may affect the pellets’ quality and forming rate. The size should be smaller than the diameter of holes on flat die, usually 4-5mm, or they would block the holes and cause damage to the pellet machine. Besides, there are usually some impurities and foreign matters in straw materials that you must remove. For pre-treatment, you need a hammer mill to crush large straw materials into small size, and a dryer to lower the moisture content. But the dryer is optional, for straws can be dried by air. After pre-treatment, you can feed these materials into the pellet machine, sometimes with the help of a conveyor. The straw pellets produced by our machine present high density and hardness, with smooth surface and no cracks. They are cylinders whose diameter is 6-8mm, and the length is 4-5 times of the diameter. Straw pellets have high temperature when they are extruded from the pellet machine. You can use a counter flow pellet cooler to cool it down, or leave them in open air for cooling. After that, you can pack them into bags for storage and transport. For large scale production, a packer machine is necessary. Take full advantage of your straw ! If you have stable supply of straw, whatever they are wheat straw, rice straw, maize straw, cotton straw, you can take full advantages of them by making straw pellets. 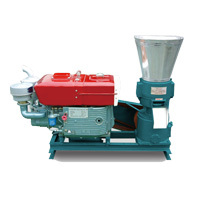 For small-scale production and home use, a hammer mill and a pellet making machine is enough. For large-scale production, selling or factory use, you can consider building a straw pellet plant. TICO has rich experience and professional knowledge on biomass fuel production and pellet machine manufacture. We offer individual pellet machine and auxiliary equipment, as well as complete pellet plant. If you have any interest or question, please feel free to contact us. We can figure out customized solution according to your situation.